This article was originally published by the Centre for International Policy Studies (CIPS) on 1 October, 2015. There is no more annoying phrase in discussions of international affairs than “If the United Nations did not exist, we would have to invent it!” It is certainly true that the world urgently needs an effective collective security organization today. But the organization it needs bears only a passing resemblance to the UN we currently have. A genuinely “fit for purpose” UN would have the tools to manage three dangerous trends in international conflict. The first is the resurgence of major power competition in trouble spots such as the eastern Ukraine, South China Sea and Syria. The second is the proliferation of transnational violent extremism in the Middle East and North Africa. The third is the problem of chronic instability in fragile states and regions such as the two Sudans. The actually existing UN has largely focused on the third of these challenges over the last fifteen years, deploying tens of thousands of peacekeepers from West Africa to Darfur, and assisting the African Union’s efforts to stabilize Somalia. It has made real progress in building half-decent states in cases such as Sierra Leone and Liberia. Even where this has proved impossible, as in South Sudan, under-equipped blue helmets have hung on to guard vulnerable civilians. Yet in places like South Sudan and perhaps the Central African Republic (CAR), the UN appears to have waded into quagmires with no feasible exit strategy in sight. In these quagmires, as I recently argued in the Georgetown Journal of International Affairs, venal leaders, weak institutions and corruption obstruct progress towards sustainable stability. UN forces stay in place because the alternative – unrestricted anarchy – seems even worse. But in some cases they arguably abet abusive regimes. It seems likely that the UN will have to muddle along managing chronically unstable states for the foreseeable future. It seems likely that the UN will have to muddle along managing chronically unstable states for the foreseeable future, although the Obama initiative hopefully presages a gradual improvement in the quality of forces the organization fields. African states and organizations are also building the military and civilian capabilities to relieve the UN, although this is a slow process. In cases such as CAR, the UN needs to dig in and assume that it will be years and quite possibly decades before it can withdraw. This is arguably what the UN is for: providing solutions to peripheral conflicts. But does the organization have a role in the central conflicts of our unsettled times, including those involving great power competition and transnational terrorism? To take great power competition first, the UN has only a minor diplomatic role in the Ukrainian conflict. 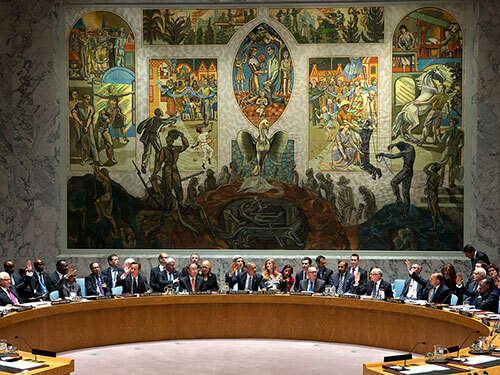 Given the structure of power in the Security Council, it is hard to see the UN as a major actor in conflicts involving the U.S., Russia and China. Yet the UN did play a significant if sporadic role during the Cold War in easing great power stand-offs in cases such as the Suez crisis and Yom Kippur war. The Kennedy administration even considered asking the UN to monitor the withdrawal of Soviet missiles from Cuba in 1962, and UN officials played a quiet role in facilitating the Soviet departure from Afghanistan in the 1980s. More recently, UN envoys played a central role in de-escalating Russian-American tensions over Kosovo. The UN Secretariat should maintain the diplomatic capabilities to assist Moscow, Beijing and Washington de-conflict and de-escalate in crises that shake the international system. The new Secretary-General is also going to need a clear pitch about how the UN can contribute to the long-term stabilization of countries and regions plagued by transnational extremism, such as Libya, Syria, Yemen and Iraq. The Ukrainian case, and the strained Syrian mediation process, suggests that Ban Ki-moon’s secretariat does not currently have these capabilities. Ban’s successor, who will take office in 2017, will need to ensure that they have advisers well-versed in Russian and Chinese diplomacy and strategy (and with good contacts in both countries) is she or he is going to have a significant place on the international stage. The new Secretary-General is also going to need a clear pitch about how the UN can contribute to the long-term stabilization of countries and regions plagued by transnational extremism, such as Libya, Syria, Yemen and Iraq. Existing blue helmet missions are already struggling to fend off Islamist attacks in Mali and the Golan Heights. Ban Ki-moon’s high-level panel on peace operations explicitly warned that the UN lacks the capabilities and doctrine to undertake counter-terrorism missions. Yet there has been serious talk of sending blue helmet forces to both Syria and Libya, and the current Saudi-led coalition in Yemen may eventually turn to the UN for help. Like it or not, the UN may have to develop new operational models for stabilizing countries affected by transnational extremism. Russian officials consistently identify counterterrorism as one area where they can cooperate with the West at the UN. Despite current ructions over Syria, it may prove unavoidable. These models would involve very different forces, command structures and rules of engagement to most current peacekeeping operations. Developing these could be the primary task for Ban Ki-moon’s successor, who would also have to balance the demands of robust operations with the UN’s humanitarian work across the Middle East. In undertaking this task, she or he could benefit from advice from countries such as Canada that have experienced some similar dilemmas in Iraq and elsewhere. Given the poor state of international cooperation, it may hard to imagine the UN taking a more central role in reducing great power competition and tackling violent extremism. Yet if the UN does not play a role in these fields, it will become ever more marginal to global affairs – so the organization really does require reinvention. Richard Gowan is a fellow at the European Council on Foreign Relations, a non-resident fellow at NYU’s Center on International Cooperation, and an adjunct professor at Columbia University’s School of International and Public Affairs. He writes a weekly column (“Diplomatic Fallout”) for World Politics Review.